Consumerist reader and former JCPenney employee Ron says he’d had some residual loyalty for the department store. 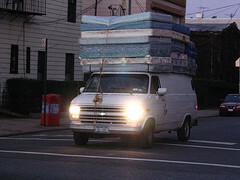 That was before JCP not only lost his new mattress then suggested he rent a truck to pick it up. He might have even done it, if anyone could tell him where the mattress was. Ron says things got off to a bad start right away. After two weeks of waiting, he finally got the call that his bed would be delivered. But when the truck came, it was only carrying his bed frame — no mattress. So he called JCP, where he was of course given the happy news that his mattress had just been delivered. He had to explain to the CSR that, no, only a frame had been dropped off. Where is the mattress? That’s when he got put on hold. Having already disassembled the old, dilapidated mattress and thrown out the mattress pad and cover, this was not what Ron wanted to hear. Another call to JCP found that the mattress had been misrouted to the wrong hub, and that it would require another week to arrive. This led to a flurry of phone calls and transfers that concrete proof that his mattress was in New Jersey… or Pennsylvania… or maybe even Buffalo, which just happens to be where Ron lives. After hanging up on one particularly condescending CSR who Ron says kept repeating the phrase, “I understand, but you’re not getting your mattress when you want it,” he got a rep who offered a solution — rent a truck and pick it up himself. 2-Even if he could pick up the new mattress, no one would be picking up and disposing of his current mattress, so he’d have to do that on his own too. 3-He’d gotten so many answers about where his mattress was that he wanted actual proof it was at the Buffalo location. But this was not to be, as the rep’s boss said the CSR was mistaken. The mattress was actually in Pennsylvania. Ron had also been promised some sort of compensation for his wait and for being put-out, but the supervisor said no. Not only would he have to wait for his mattress, but there would be no attempt to offer him anything to ease the annoyance. Ron says the supervisor also had a suggestion as to where he could sleep — on an air mattress. After spending hours on the phone, Ron finally opened up the boxes the truckers did deliver, only to find he’d been sent the wrong frame. This morning, in spite being told earlier that there was no point in calling today because of Martin Luther King Day, Ron called up JCP on a whim… and was miraculously able to talk to someone. Not that this person was any great help. In spite of his past good feelings for the store, this one horrible experience has soured Ron on JCP for life.